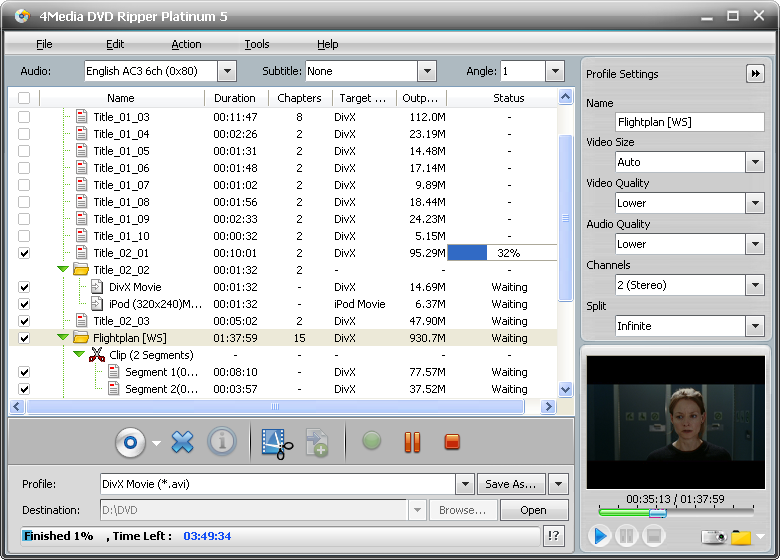 4Media DVD Ripper Platinum helps you easily take enjoyment in DVD movies and music by ripping DVD to AVI, MPEG-1/MPEG-2/MPEG-4, WMV, DivX, MP4, H.264/AVC, RM, MOV, M4V, XviD, 3GP, VOB, FLV, SWF, etc, and extracting DVD audio to save as audio formats like MP3, WMA, WAV, RA, M4A, etc. The output is of amazing sound and picture quality. Chapter or segment selection, output file size customize and custom profile creation also available. Qweas is providing links to 4Media DVD Ripper Platinum 5.0.64.0304 as a courtesy, and makes no representations regarding 4Media DVD Ripper Platinum or any other applications or any information related thereto. Any questions, complaints or claims regarding this application 4Media DVD Ripper Platinum 5.0.64.0304 must be directed to the appropriate software vendor. You may click the publisher link of 4Media DVD Ripper Platinum on the top of this page to get more details about the vendor.